On the heels of his success with the famed reality television show,"America's Got Talent," and since touring with Mumford and Sons, this magical dragon is bringing big laughs and unexplainable magic to Las Vegas. With a shtick unlike any other performers we've met, Piff and Mr. Piffles (the World's Only Magic Performing Chihuaua) will be wowing audiences with a collection of their greatest routines from their evolving magical repertoire. 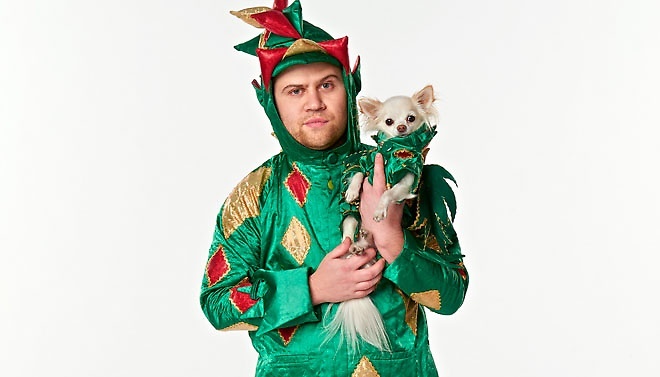 In addition to the one-hour solo show, Piff The Magic Dragon and Mr. Piffles will be celebrating the holidays with"Piff's Piffmas Piff-Tacular," which will run Monday, December 21 through Wednesday, December 30. Don't miss your chance to have a laugh and be amazed when Piff and his furry pal take the Vegas stage in Bugsy's Cabaret at Flamingo Las Vegas. 8 p.m. Monday - Wednesday. 3790 S. Las Vegas Blvd. Location:Located in front of the New York-New York hotel-casino on the Las Vegas Strip. Are you ready for a two-story Las Vegas Strip sugar rush? Hershey's Chocolate World is sure to do the trick. The 13,000-square-foot West Coast flagship store is packed with more than 800 types of Hershey's brand products such as Hershey's chocolate bars, jumbo-sized Hershey's chocolate and strawberry syrup bottles, Reese's peanut butter cups and pieces, Ice Breakers, Jolly Ranchers and Twizzlers. Downstairs there's a colorful wall of Hershey's Kisses dispensers for your bag-filling pleasure while upstairs are different flavors of Jolly Ranchers. Hershey's Chocolate World sells plenty of momentos and gifts, including clothing, coffee mugs and other fun items, and even has a bakery counter offering delicious freshly made treats. While you're shopping, you'll also come across several interactive experiences. Touch screens allow you to send your friends a virtual Hershey's Kiss, view a timeline of Hershey's history, design a candy bar wrapper or discover your ideal Reese's combination of chocolate and peanut butter. Sweet photo opportunities include an 800-pound replica of the Statue of Liberty carved from Hershey's Milk Chocolate or a replica of the Empire State Building made from 1,800 Hershey's Milk Chocolate bars. 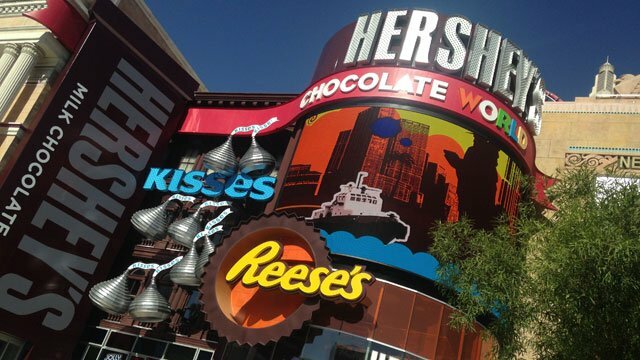 Hershey's Chocolate World won't do any favors for your diet, but it will make your Vegas vacation a whole lot sweeter. Admission is free. Retail, candy and food items vary. Cash, American Express, Discover, Mastercard, Visa. Located in front of the New York-New York hotel-casino on the Las Vegas Strip. Location:Located at the Circus Circus hotel-casino, at the intersection of the Vegas Strip and Circus Circus Drive. Buckle up, hold on tight and get ready for a thrilling adventure at the motion ride in theAdventuredome. Fasten your seat belts for a wild 4-D movie ride featuring fun computerized graphics and a whole lot of shakes and bumps. This isn't your average kiddie ride, folks. Movies change throughout the year, but visitors can currently enjoy "Happy Feet - Mumble's Wild Ride 4-D." Race down the frozen cliffs of Antarctica with Mumble and his penguin pals. Mumble's fun turns into a suspenseful chase when he comes face-to-face with his leopard seal nemesis. Still doesn’t sound like fun to you? Here’s a little secret, there’s always alcohol nearby. 11 a.m. - 6 p.m. Monday - Thursday, 10 a.m. - midnight on Friday - Saturday and 10 a.m. - 9 p.m. on Sunday. Holiday hours are from 10 a.m. - midnight. $5 - $12 per ride or roller coaster. All-day passes to the Adventuredome are $29.95 for adults and $17.95 for children 33-47 inches tall (free for toddlers under 33 inches with a paying adult). Cash, Mastercard, Visa, American Express and Discover. For birthdays, private parties and groups. Located at the Circus Circus hotel-casino, at the intersection of the Vegas Strip and Circus Circus Drive. Brooklyn Bowl at The LINQ Promenade isn't in the same league as other bowling alleys. One might even say this Las Vegas Strip venue throws the typical bowling alley for a curve. It's a bowling alley. It's a concert venue. It's a restaurant. That's just how they roll. The bowling alley features 32 Brunswick state-of-the-art lanes including huge high-def projection screens above the pins. Located adjacent to a standing-room-only concert venue, each lane accommodates up to eight bowlers at a time. Bowlers enjoy restaurant-style service at the lanes and an elevated bowlers' lounge with comfy chesterfield sofas. If you're bowling during a concert, you'll also experience live entertainment by some of the hottest bands around (show tickets must be purchased to bowl during a concert). Brooklyn Bowl is great for families (prior to 8 p.m.), serious bowlers and the party crowd. Shoe rental is available for the tiniest of feet all the way up to size 15. So grab your balls (get your minds out of the gutter) and come give Brooklyn Bowl a spin. Cost is $25 for 30 minutes from 11 a.m. to 6 p.m. and $30 for 30 minutes from 6 p.m. to close. Lane pricing varies during ticketed events. Shoe rental is $5 per person. Socks can be purchased for $4 per person. All ages welcome until 8 p.m. Guests must be 21 years or older after 8 p.m. Shoe rental available for toddlers up to size 15. Bowling lanes are fully ADA compliant. At more than 105,000 square feet, Shark Reef is home to more than 1,200 different species of sharks, tropical and fresh water fish, reptiles, marine invertebrates and rays totaling about 2,000 animals among 2 million gallons of seawater. The ocean is probably the last thing people think of when they visit the dry desert of Las Vegas, but the Shark Reef at Mandalay Bay is changing that. Housing more than 1,200 species of marine life including sharks, exotic fresh and saltwater fish, a 300-pound sea turtle and much more, Shark Reef offers the aquatic experience of a lifetime. The only accredited aquarium by the American Zoo and Aquarium Association in Nevada, Shark Reef is popular with tourists and marine experts alike. Only 10 percent of aquariums are accredited nationwide, making it one of the most prestigious facilities of its kind, along with the San Diego Zoo and Sea World. Shark Reef is reminiscent of an ancient temple slowly sinking into the ocean. The tunnel, which houses five species of sharks and the aquarium's largest animals, is designed to look like a sunken shipwreck and contains 1.3 million gallons of water. Here, visitors can witness a scuba diver's view of these mesmerizing creatures, including nurse sharks and tiger-striped sharks measuring up to nine feet long, and two tiger sharks that measure more than six feet in length. Since the sharks at the Shark Reef are fed on a daily basis, the surrounding animals are in no danger. Sharks are fed three times a week, which is more than they would probably eat in the wild. In fact, the half-inch Blue Damsel, the tiniest fish at the Shark Reef, shares the same tank with these gigantic creatures. When divers swim in to clean these tanks, they wear a stainless steel mesh, similar to what knights wore long ago. The metal helps keep the animals away so the humans don't look like food. In addition to the shark tunnel, guests can experience exhibits featuring crocodiles, freshwater fish, piranhas and much more. Since many of us aren't planning to pet a piranha anytime soon, visitors can enjoy getting a "hands-on" experience with various stingrays, eels and crabs at the touch pool. Also at the Shark Reef is an eight-foot-long Komodo dragon, the largest species in the lizard family. Classified as an endangered species, there are only 3,000 to 5,000 that live in the wild. At Shark Reef, this particular Komodo lives within an environment similar to its habitat, complete with sand, boulders and a pool. The Shark Reef is also home to colorful catfish, saw fish, beautifully patterned black-and-white potato cod fish and spiky mine urchins. The mine urchins do not move much, but visitors may catch a group of them munching on a "cookie," a nutritious wafer created specifically for their diet. Visitors can also see a live female bowmouth guitarfish. Better known as a shark ray, this animal is considered a vulnerable species and very little is known about it. The 5-foot, 90-pound shark ray is one of only a dozen featured in aquariums throughout the United States. For those who want an in-depth, personal enrichment about the animals, audio wands are available in Spanish, English and Japanese. In addition, Shark Reef's naturalists are available to answer any questions visitors may have. Guests can also take part of the sea with them long after they leave Shark Reef. Located at the end of the exhibit, Shark Reef's gift shop features an assortment of figurines, picture frames, trinkets and souvenir photos for those who took one right before the tour. $18 for adults, $12 for children 5-12. Children age 4 and under are admitted free. Nevada residents with proper identification get a discount. Stingray Feed Experience costs $50 per adult and $40 for children (ages 5-12). Sea Turtle Feed Experience and Shark Feed Experience each cost $70 per person and include admission to Shark Reef Aquarium. Participants in the feeding programs can purchase a guided tour for an additional $25. Cash, MasterCard, Visa, American Express, Discover and traveler's checks. The attraction may be rented out for private functions. Located at Mandalay Bay hotel-casino near the intersection of the Vegas Strip and Hacienda Avenue. The Stingray Feed Experience is open to those 5 years of age and older. The Sea Turtle Feed and Shark Feed experiences are open to those 13 years of age and older. Location:Inside the The LINQ Hotel & Casino on the Vegas Strip between Spring Mountain and Flamingo roads. The Auto Collections is entertaining for car aficionados and even those who wouldn't typically give cars the time of day. Located on the fifth level of The LINQ Resort & Casino self-parking facility, The Auto Collections showcases 300 classic cars including racing cars, muscle cars and much more. Since the exhibit is constantly changing, you'll never see the same set of cars twice. You can buy a car here, but even if you don't have the thousands of dollars to spare, you can stand by these beauties and take as many pictures as you want. It's not every day you get to see rows and rows of Rolls Royce cars as well as old-school Ferraris, Corvettes, Impalas, Volkswagen Beetles, military vehicles and much more. Aside from all the classic luxury cars, The Auto Collections also features military-related vehicles. The 1963 Chevrolet Nova Memorial Racecar on display is dedicated to all the fallen and living United States Marines of the Iraq war. While this car isn't for sale, a picture is priceless. Another military vehicle on display is the flat grey 1941 Willy's military jeep. Used in the military during the beginning of World War II, the jeep was restored in 1959. If you're into racing and have $350,000 to spare, the 1986 Ford R5200 Evolution from Europe would be a fun investment. This speedster was actually banned from a rally competition in the late '80s for being too fast and dangerous. Exactly how fast are we talking about? This sleeper is capable of reaching 60 mph in a whopping 2.1 seconds. Here you'll also find the iconic Volkswagen Beetle (better known as the "Bug"). For $45,000, you can own an award-winning (41 different awards, to be exact) red 1957 VW Beetle Ragtop. Another popular Volkswagen model on display is the baby blue 1961 Microbus Double Door Camper. Ideal for camping, this fully restored camper has maple wood interior, giving it a luxurious touch. While it's a fun road trip type vehicle, it doesn't come cheap. The fancy camper is $85,000. If you're really ready to splurge and a Rolls Royce is the only way to go, why not go with the 1967 Rolls Royce Phantom V PV23 (James Young Limousine) for $400,000? One car, such as the 1930 Duesenberg J Murphy Town Car, is so expensive that customers would have to inquire about the price. This award-winning Town Car is only one of four that exist in the world. Jimmy Velvet, singer and longtime friend of Elvis Presley, signs autographs and books at the Auto Collections on certain days of the week. Visitors can also watch old car commercials as well as a Johnny Carson clip in which he talks about his own classic car collection. Seating areas are available so you can rest your feet. Before you leave, make sure to check out the gift shop. You'll find books on foreign, race, hot rod and American cars, old-school rotary phones, toy model cars, Elvis memorabilia, customized name plates and parking signs, board games and fun random trinkets. Visitors to the Auto Collections are in for a treat as automotive expert Rick Titus hosts the award-winning radio show Drivers Talk Radio from inside the showroom floor, weekly on Tuesdays and Wednesdays. The show reviews the newest vehicles in the automotive marketplace, covers thought-provoking automotive topics and includes live interviews with the industry's movers and shakers. $11.95 for adults, $8 for seniors 65 and children 6- 12. Children 5 and under are free. Includes headset for no additional cost. Inside the The LINQ Hotel & Casino on the Vegas Strip between Spring Mountain and Flamingo roads. Location:At the Mirage Hotel and Casino. Right on the Las Vegas Strip is an attraction that defines wild in Vegas in a whole new way. Welcome to Siegfried and Roy's Secret Garden and Dolphin Habitat at The Mirage Hotel & Casino where white tigers and lions, leopards and dolphins enjoy the Vegas sun and a posh resort like the millions of human tourists who visit the city each year. The facility, which opened in 1990, is the dream of legendary magicians Siegfried Fischbacher and Roy Horn, better known to millions as Siegfried & Roy. For years the duo has worked to help save endangered animals, primarily white tigers and lions. If you loved collecting those big, cuddly stuffed animals as a kid, then visiting the Secret Garden at the Mirage is a dream come true. Here you can see your furry friends come to life within the lush surroundings of the habitat. The beautiful attraction displays six different showcases of white tigers and lions, as well as leopards. But the majority of these cats aren't like the typical wild animals you see. "These are some of the most impressive cats I've ever seen," said Dave Blasko, director of animal care at The Secret Garden. "People come from all over the world to see them." The Secret Garden stands out from other animal habitats because it features white striped tigers as well as snow white ones. With their distinctive fur color and crystal blue eyes, the cats almost seem unreal. For more than 20 years, Siegfried and Roy dedicated their time in preserving these rare and exotic breeds. Not only does the Secret Garden preserve these animals from extinction, but visitors also have the opportunity to gain a better understanding and awareness about them. As you meander through the habitat, you'll notice all the lush greenery, fun, jungle-themed music and even a towering lion figure made from plants. Some of the cats even have built-in waterfalls in their resting areas. You'll also discover fun facts about the animals written on plaques spread throughout the facility. For instance, female lions do most of the hunting while the male lion watches over the pride. Also, tigers actually enjoy swimming. "Tigers are one of the few cats who like water," said Blasko. If you want to take some of the wildlife back home with you, the gift shop at the Secret Garden offers souvenirs. Together with its lush foliage and gorgeous waterfalls, the Secret Garden is the ideal place to visit any time of the year. With all its trees and tropical surroundings, you'll literally feel like you're in another country. Surrounded by palm trees, lush foliage and 2.1 million gallons of water, the Dolphin Habitat at the Mirage is truly an oasis on the Las Vegas Strip. Whether the bottlenose dolphins who call the habitat home are swimming, "tail walking" across water, catching fish or bonding with each other, you'll get an up-close and personal look at their fun, intriguing lifestyle. While many people think of Sea World when they think of dolphins, many don't realize that they can see the creatures right in the midst of the Las Vegas desert. The Dolphin Habitat is a research facility and is also designed to educate people about these amazing animals. And while the dolphins don't perform on a regular schedule, visitors can still be surprised by their natural playfulness. Exercising is also very vital to the dolphins' health. When the trainers aren't exercising or having fun with the dolphins, they conduct regular check-ups to ensure that they're healthy. The Dolphin Habitat offers an underwater viewing area. But if you're trying to take a picture of the dolphins, it can get a little tricky. Since these dolphins are so swift and playful, you may find yourself running back and forth to capture the perfect photo. The habitat also features shaded seating, a café and a gift shop filled with memorabilia including plush dolphin toys and even dolphin-shaped water guns. Dolphin Habitat visitors who wish to get a little more involved with the animals can choose from a couple different programs. Painting With the Dolphins allows you to create a mammal masterpiece. Available from noon to 3:30 p.m. daily, you will get up close and personal with a dolphin as you collaborate on creating an original piece of art. Cost of $199 includes price of admission, your unique masterpiece, a certificate and a photograph of the experience. The Trainer for a Day program, meanwhile, is an all-day activity allowing guests slip into a wetsuit and get up close to the dolphins. From 9:45 a.m. - 3:15 p.m. you will interact with and feed the dolphins while accompanied by habitat staff. A staff member will snap photos of your experience throughout this this once-in-a-lifetime opportunity. At the end of the day, your photos will be put on a CD for you to take home as a one-of-a-kind souvenir. Price varies between $495 and $595 depending on the season, with a four person maximum. Whether you come to see the dolphins or some of the rarest white tigers and lions in the world, The Secret Garden and Dolphin Habitat may prove to be the wildest moment on your Vegas trip. Daily, 10 a.m. - 5:30 p.m. (hours of operation are subject to change due to special events or inclement weather). Admission to both exhibits is $19.95 for adults, $14.95 for children (ages 4-12) and free for children under 3. Annual passes are available. At the Mirage Hotel and Casino. Guests under the age of 13 must be accompanied by an adult 18 years or older.